Feeding a crowd? It’s easy to whip up a pan (or two!) of this tasty Spinach, Caramelized Onion and Bacon Sheet Pan Pizza. No word elicits more love around this house than pizza (except maybe chocolate). Having a sheet pan pizza recipe in my back pocket is an easy way to deliver everyone’s favorite flavors on a large scale. This Spinach, Caramelized Onion and Bacon Sheet Pan Pizza is no classic pepperoni and cheese combo, though. 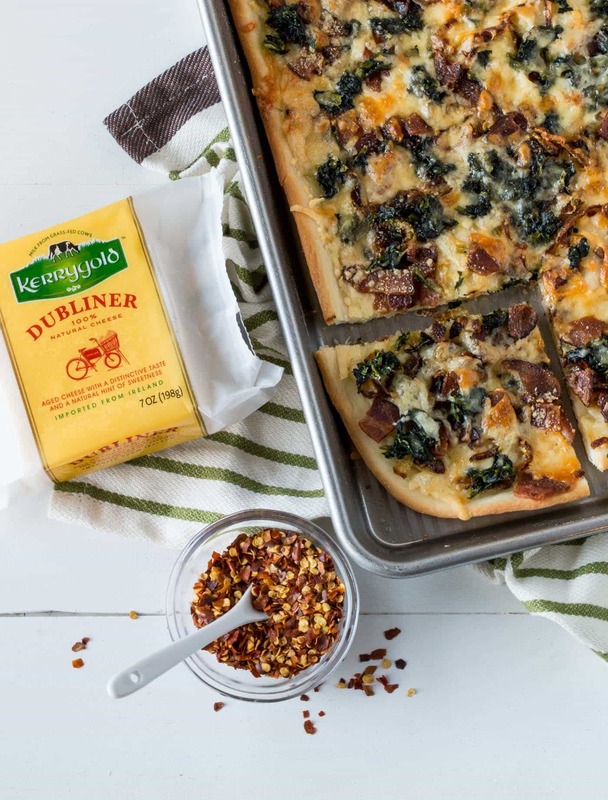 It’s unique, delicious flavor comes from distinct ingredients, including a generous topping of melted Kerrygold Dubliner Cheese. Taking a few extra minutes to prebake the pizza crust makes a world of difference in your finished pie. Grease your baking sheet with a bit of oil before popping it in the oven to help the bottom crisp up before adding the toppings. Don’t forget to poke a few holes in the dough before baking, too, to minimize the number of air pockets in your crust. Once your prebaked crust comes out of the oven, brush a bit of oil over the top and edges of the crust to help it to brown evenly during the final bake. Be creative with your toppings but don’t go overboard. We are programmed to think more is better, but try not to overtop your pizza. You’re working with a thin crust, so if you go think just an extra handful of an ingredient or two can’t hurt, think again. An overloaded pizza is likely to result in a soggy crust that can’t support all of that topping goodness. Tip: Squeeze out as much of the liquid as you can from the defrosted spinach to prevent the pizza crust from getting soggy. What I love about sheet pan pizza is that you can cut it into smaller pieces to use an appetizer or slice it into large squares for dinner. Hosting a large group? You can easily bake two pans of this Spinach, Caramelized Onion and Bacon Sheet Pan Pizza at the same time. Just rotate the pans halfway though baking to ensure they cook evenly (especially important if your oven has a hot spot like mine). Feel free to cook the onions and bacon, defrost the spinach and shred the Dubliner Cheese the day before you make the pizza. All will keep in the fridge until you’re ready to use them. 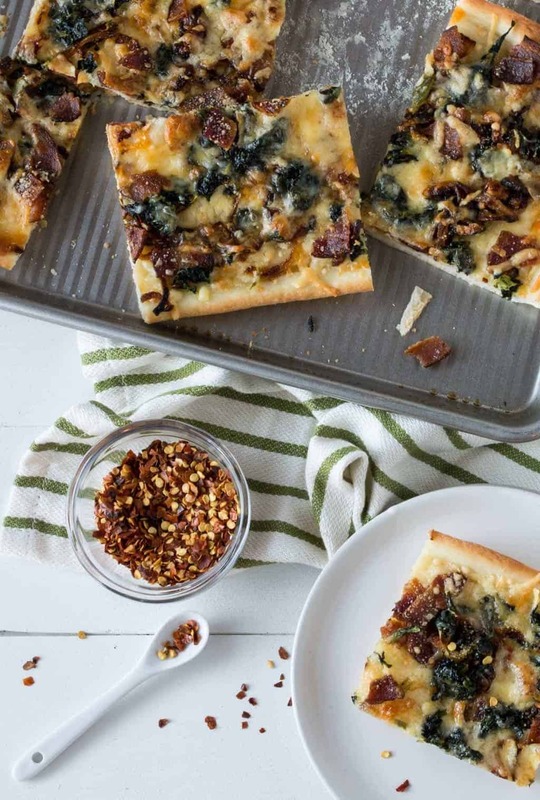 Anything to make getting this Spinach, Caramelized Onion and Bacon Sheet Pan Pizza get in my belly quicker is a win in my book! Melt the butter and olive oil in a large saute pan over medium-low heat. Add onions and stir to coat. Cook for 20 minutes, stirring occasionally. Sprinkle the salt and sugar over the onions and continue to cook for another 30 -45 minutes, stirring occasionally. You're looking for a deep, rich brown color. They may start to stick to the pan a little. It's OK if they form a bit of a crust, but don't let them burn. Two minutes before removing the onions from the heat, add the garlic and crushed red pepper flakes and saute. Remove from heat and set aside to cool. Preheat the oven to 425 degrees. Lightly grease a sheet pan. Set aside. Roll dough into a rectangle slightly larger than the sheet pan. Place dough on pan, prick with fork in several places and bake for 8 minutes. Remove pan from oven and lightly brush top of crust with olive oil. Layer on half of the Dubliner cheese followed by the onions, bacon and spinach. Top with remaining Dubliner and parmesan cheese. Bake for another 12-14 minutes or to desired degree of doneness. Remove from oven and allow to cool for 5 minutes before slicing and serving. The caramelized onions can easily be made a few days before the pizza and stored in the refrigerator. Omg made this last night but grilled it instead. divine!! !